These lively, informative essays, all related to music, are as accessible as a chatty bedside reader. A central theme is listener response, and the techniques and structures that mold it.The story starts with sound waves, the ear, and the brain. Did song come before speech? Was it a factor in evolution? Some think singing helps complete the wiring of that organic work-in-progress, the infant brain.Check out the frequency doubling that built our familiar scale. Learn where the word 'organizing' came from. Follow development of the instruments as they achieved volume, accurate intonation, range, and consistent timbre.There is criticism, but little disparagement. Any willing audience deserves respect. Musical examples come from Tin Pan Alley as often as the opera. Whether at a jazz club or the concert hall, the writer cannot hide his impatience with artists seeking to educate or intimidate.Music can be recreation or vocation. Does your instrument match your personality or some physical attribute? We instantly distinguish a bell, a piano, and a guitar; why not a clarinet, flute, or violin? What does the conductor do? 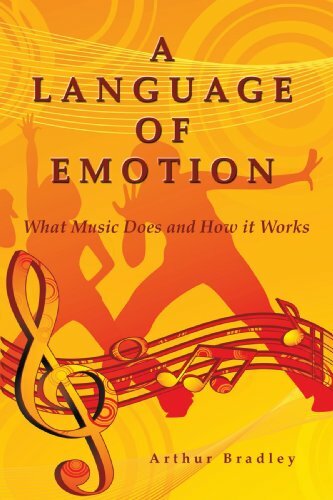 A Language of Emotion embraces such matters.The relatively imprecise science of Psychology examines music working its magic. We all have favorites. Is it hype and marketing and peer influence, or do our choices make personal statements? Music, politics, religion, and social forces are twisted threads in the fabric of civilization.Nothing reflects the spirit of an era better than the works of its most creative individuals. In most cases, they blend smoothly in sequence. Monteverdi, Beethoven, and Stravinsky, to name just three, clearly got ahead of the curve and helped define the world around them.